Head of the group: Assoc. Prof. Jiří Tuček, Ph.D. The group focuses on study of magnetic properties of various nanostructured materials based on iron, nonhydrated iron oxides and carbon and their hybrids including also molecular complexes. A significant attention is devoted to understand the mechanisms driving the materials’ magnetic features, describe the magnetic behavior in the nanoworld and identify parameters that can tune the magnetic properties to enhance the materials’ applicability. The applicability of such nanostructures spans from technological, biomedical to environmental fields in which they are tested. For a magnetic characterization, a broad portfolio of experimental techniques are employed including Mössbauer spectroscopy in various modes (low-, room-, and high-temperature, in-field, in-situ, etc.) magnetometers (SQUID, PPMS device), and EPR. Besides, the group disposes of instruments for TG and DSC analyses. The group activities also involve simulation and theoretical studies constructing models to describe the magnetic properties of, particularly, carbon nanostructures. Besides research, the group participates in development and construction of Mössbauer spectrometers that are sold worldwide. Head of the group: Prof. RNDr. Michal Otyepka, Ph.D.
Graphene and its derivatives (fluorographene, graphene oxide) belong to extensively studied compounds within the framework of our research. The research includes the development of novel methods for the functionalization and chemical modification of graphene and its derivatives. We benefit from a tight connection between both theoretical and experimental approaches. Other research directions include explorations of fluorescent carbon quantum dots and their application for cell imaging, along with the study of porous carbon nanostructures for environmental and catalytic applications. The group develops theoretical methods and tools for the study of biomacromolecules and nanomaterials. The focus is on the structure and dynamics of biomacromolecules and their functional components, on the interaction of biomacromolecules with membrane bilayers, on enzyme and RNA catalysis. Head of the group: Prof. RNDr. Zdeněk Trávníček, Ph.D. The group focuses on novel complex compounds of transitional elements, particularly on the development of novel types of biologically active compounds with medical application potential (e.g. substances with tumour-fighting, anti-inflammatory or antidiabetic effects), the preparation and study of molecular magnets and molecular switches which may be used, e.g. for sensors, high density memory or recording media, research on hybrid molecular-crystalline nanostructures with functionalized nanocrystalline iron oxides bound to a coordination compound. Head of the group: Prof. RNDr. Miroslav Hrabovský, DrSc. The group focuses for a long time on research into optical quantum and nonlinear phenomena, as well as quantum information, research on nonstandard detection systems based on optics with sensitivity to individual photons, special micro/nano optical surfaces and corresponding optical technologies and measurement methods. Other directions include the development of methods for the deposition and characterization of thin films using plasma and vapour deposition. The group develops optical contact-free measurement methods based upon interferometry in coherent speckle fields and white-light and moiré topography. The group also participates in prestigious international projects such as CERN-ATLAS (research on the nature of matter at the LHC accelerator at CERN in Geneva) and the Pierre Auger Observatory (research on high energy cosmic radiation). Head of the group: RNDr. Václav Ranc, Ph.D. The research of the group Bio-Med is aimed on two overlapping fields: synthesis of novel nanomaterials and their consecutive application in biological and medicinal branches. Synthetic part of the group has a long time history in a design and synthesis of nanomaterials based on metals (iron, silver, gold, platinum) or their respective oxides. The resulting form of nanomaterials includes nanocomposites, nanoalloys as well as core-shell structures. 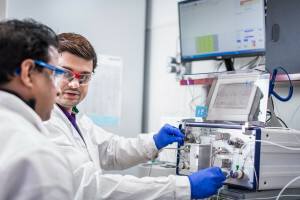 Our infrastructure allows a characterization of nanomaterials using microscopic techniques as well as a study of interactions of selected nanomaterials with living systems on cellular level and on animals. 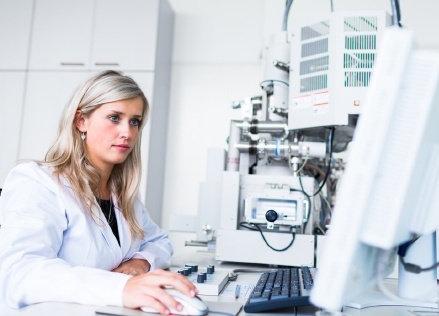 Application part of the group specializes in a development of diverse analytical procedures applicable in medicinal diagnostics, environmental chemistry or toxicology or design of novel contrast agents applicable in MRI. Head of the group: Prof. RNDr. Karel Lemr, Ph.D.
Head of the group: Mgr. Jan Filip, Ph.D. 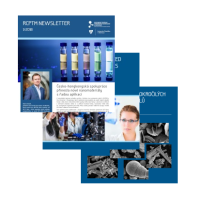 The main emphasis of the “Environmental Nanogroups” at RCPTM has been the design and development of advanced nanomaterials and technologies for the applications in environmental chemistry including sustainable applications in catalysis. Presently, our group is working on three major areas: 1) Earth-abundant materials for environmental applications, 2) benign catalytic applications and 3) photo- and electrochemical applications. The first area encompasses the development of iron-based species (namely zero-valent iron, ferrates etc. ), for the environmental applications including water purification by removal of toxic materials, investigation of ecotoxicity of metal-based nanoparticles etc. The second area focusses on the catalytic applications of metal, metal-oxide, carbon-based nanomaterials for important organic transformations. In this category, our progress in the field of iron-oxide supported catalytic systems offers unique advantages of high recyclability and magnetic separations, thereby making such processes more environmentally friendly as well as economical. In addition, our recently installed state-of-the-art microwave and “Flow reactor” also contributes significantly in enhancing the productivity of the group. Finally, the recent upsurge in the field of photo- and electro-chemistry particularly for their energy-related applications including solar cells, electrocatalysis etc. have also prompted us to be a part of this endeavor and we have been engaged in developing novel materials to be applied in photo- and electrochemical applications. The Photoelectrochemical group aims at developing a new class of multicomponent hybrid systems (HNS) composed of a central material (CS), most likely metal oxides semiconductors (TiO2, α-Fe2O3, ZnO, WO3, BiVO4, etc.) and carbon based materials with controlled shape and dimensionality (e.g., 1D-nanotubes, 2D-ultrathin films, 3D branched nanoarchitectures, etc.) that will work as highly photocatalytically and electrocatalytically active materials for a broad portfolio of energy and environmental applications including direct splitting of water, photocatalysis, electrocatalysis, dye sensitized solar cells, etc.. The key-approach is represented by the simultaneous and synergistic combination of strategies (nanostructuring, co-catalyst deposition, surface sensitization) that are still very often studied and developed independently. Therefore, the nanostructured CMs are coupled to counterparts with specific functionalities (extended visible light absorption, remarkable efficiency in charge transfer, enhanced carrier mobility) and the effective interaction of the single components will significantly benefit the PEC efficiency of the composite system. The group is very well equipped for a thorough electrochemical, photoelectrochemical, and photocatalytic investigation of the materials and hybrid nanostructures developed.